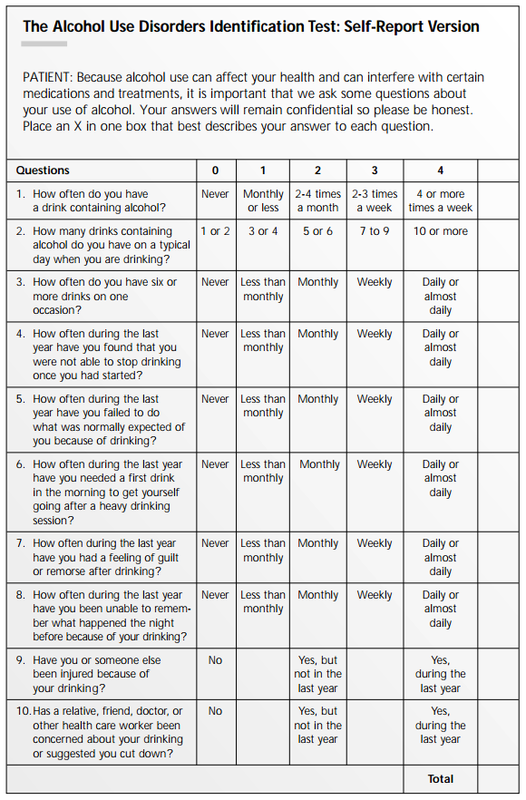 The Alcohol Use Disorders Identification Test (AUDIT) is a simple screening tool developed by the World Health Organization to help you determine whether or not you have an alcohol use disorder. By honestly answering a few questions, you can gain meaningful insight into your relationship with alcohol and consider whether or not alcohol abuse treatment is right for you. Alcohol addiction can often be difficult to recognize, most of all in ourselves. This is especially true if you are in the early stages of alcohol addiction, if you do not experience physical dependence, or if you do not have observable withdrawal symptoms. If you are struggling to get a loved one to ask themselves these questions and recognize their alcohol abuse disorder, we encourage you to reach out to us. The AUDIT isn’t an exact science—each person has different life circumstances, and one quick questionnaire isn’t enough to definitively determine anything. However, the categories below can provide a good jumping-off point for determining what level of care or resources you may need to pursue. 0-7 (0-6 for women): It is very unlikely that your drinking presents a risk. 8-15 (7-15 for women): You may be exhibiting the beginning stages of alcohol use disorder, and it may be wise to seek counseling to ensure that your drinking does not progress to more problematic levels. 16-19: You are exhibiting signs of a moderate alcohol use disorder, and should seek counseling from an addiction medicine specialist to help you take control of your drinking. 20+: Your alcohol use presents a significant risk to your well-being, and it is imperative that you get help before harm occurs. A residential or Intensive Outpatient Program may be best suited to your needs. If your score indicates that you are struggling with an alcohol use disorder, it is vital that you seek professional guidance to help you regain emotional and behavioral tranquility and start the journey toward lasting recovery. Today, there are more resources than ever before to help you move toward a healthier, more stable life. With the help of compassionate clinicians who specialize in addiction medicine, you can develop the insight and skills you need to create lasting freedom from addiction. We invite you to contact us at any time to learn more about the alcohol addiction and treatment. We are always available to provide you with any guidance you need and connect you with the resources to start on the path to sustainable recovery.